Get Organized with My Knit & Crochet Printable Planner! Have you ever started working on multiple projects and ended up forgetting about 1 or 2? Do you ever forget what hook you were using for your project? Or maybe you make changes to a pattern you bought and can’t recreate it next time? Well, you’re not alone. Most crafty and creative people get so caught up in new ideas and wanting to make all the things that some projects fall through the gaps. 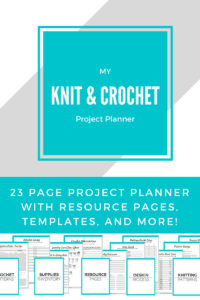 So I’ve put together a printable planner designed with knitters and crocheters in mind to help you stay on top of projects, all your resources, supplies, measurements, and even custom orders! Planners and tracking tools have made my life easier, so when I realized I needed a crafty printable planner, I looked everywhere for one. When it comes to running my blog and business, I use planners created by other bloggers who know their stuff. They know exactly what I need because they’ve done it too. Finding a good, printable planner for knitting and crocheting was a little trickier. There were planners with crafty themes and stickers, but nothing that really addressed the things I needed as a knitter and crocheter. I did find some individual pages from a bunch of different places, but I couldn’t find a single planner that had everything I needed. Also, I wanted a clean, neat look that I just wasn’t going to get with all different kinds of branding from different places. So I made my own printable planner and filled it with all of the tools and resources I use daily. 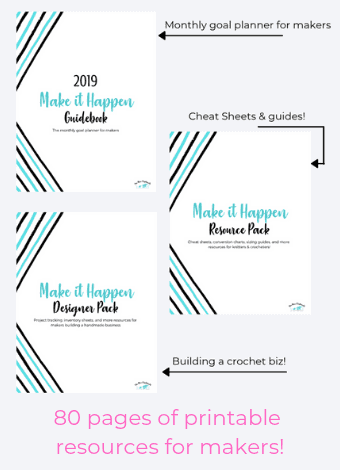 This is perfect for crafters who just want something to streamline their projects, but it’s also a great resource if your business needs a little more consistency. This 23-page printable planner is PACKED with pages to make designing patterns faster, keeping WIPs organized, and getting more done. Get Your Knit & Crochet Planner! One of the main reasons I needed this planner was to have a place to write down everything about the patterns I was currently working on, whether they were my own designs or someone else’s. I can’t tell you how many times I put a project down and forgot what hook went with it. I would pick up the wrong hook, work a few rows and realize it looked off before I realized why. And then I’d have to guess to find the right hook. The first pages I designed are to record everything about the pattern so we don’t have that problem anymore. There are spaces to write down all the details about the pattern and where you got it, what yarn and hooks you used, and whether or not you made any customizations/changes to the pattern. This is super helpful in case you need to recreate it. If you design your own patterns or want to get started, these pages create a template help you out. These pattern designing pages give you a place to jot down ideas, sketch a concept or even attach a swatch if you want to come back to it. There are places to write down what materials were used, how long it took, to note down tips so to include the finished pattern, and even give yourself a deadline so you stay on track. Then, of course, there’s a page to actually write the pattern down. This printable planner isn’t just for tracking projects, though. I have tons of hooks and needles, all in different sizes and sometimes I forget if I have a certain size. Has this ever happened to you? Then you buy the one you think you’re missing and have doubles. Also, I can never remember the US sizing and the metric sizing, and hooks don’t always say both. I don’t think anyone should have to remember that so this pages has all that information. All the metric sizes, USA sizes, and UK sizes are listed side by side along with a spot for you to check if you own that hook. There’s even a page for knitting needles and whether you have the straight needles, circulars or DPNs. Now, I can buy only what I need and not end up with doubles that I don’t need. Speaking of buying only what you need… let’s talk yarn stash. We’re all guilty of buying more yarn than we need and then forgetting about it. Sometimes, we have yarn somewhere else and can’t remember, so we just buy more. This project planner is meant to help get things under control and the yarn stash needed it the most. On these pages, you can jot down ALL the information about the yarn you have: the amount/ball, how much you have, the dye lot, the fiber content, and anything else you need. Then, before you buy, you can check if you already have what you need. It’s also great for getting ideas on what to make next. Say you have 8 skeins of a yarn already in your stash. If you wanted to make a blanket, rather than getting more yarn and paying for that, you could see what you have and find a pattern suited for it. These are pretty straightforward pages in the printable planner. One is a to-do list where you can write down all the projects you have yet to do. I left enough room there to write out what the project is and what supplies you’ll need to for it. This way, it’s in one place and it’s easy to prioritize where to start (usually with what I have). When you finish, just check it off. The ideas & inspiration page is my favorite. I’m always coming up with new pattern ideas, and I usually just write out the name I’d give it. But then I forget what it was meant to be. Or, I see something that inspired me but I still need to work out the idea a bit more. This is the brain dump page where I can just write it all out and describe what I’m going for. I like to write down the colors and stitches I’ll use and what gave me the idea, but you can add anything you like. If you make items for sale, this page is for you. You can track everything the customer ordered, how many they ordered, if they made any special requests or colors, etc. Then, write down how much the materials cost you, how much you charge the customer for the item, whether they’ve paid, if there was a discount and any other additional customer info. I get a lot of custom orders and having each order listed out helps me keep track of it. It also makes dealing with customers easier, because I have everything written down and can return to it in case there’s a problem or if they want to reorder the same thing later on. Next is the collection of resources pages included in My Knit & Crochet Printable Planner. I love these. I can’t do anything without these and I know you’re going to love them as much as I do. One page has blank areas to fill with your with favorite books, websites, designers, shops, etc. This is to help you remember where you love to go for help and information and what you find the most useful. I have a ton of favorite shops, but I can’t always remember the name correctly and this helps. There are guides for crochet abbreviations, listing the most common USA and UK terms along with what they mean. I covered stitch abbreviations, pattern abbreviations, and measurement abbreviations. There is also a knitting abbreviations guide with the same information but for knitting. I included as much as I could think of as well as ideas from you guys, plus there’s also a blank sheet for you to add your own and make it really as helpful as it can be. And there’s a laundry care cheat sheet! It includes all those symbols you see on yarn and fabric along with information on what they mean. You’ll never make a hat that doesn’t fit your recipient again with this guide. It lists every age and size and all the measurements you need to make a hat that fits perfectly. So whether you’re working top down or from the bottom up, this guide will make sure your hats fit. Every. Single. Time. The second sizing guide is for blankets and throws. I make a lot of baby blankets, and I just make them as big as I want. But sometimes, you need an exact size or an estimate for how big a queen throw is. This blanket sizing guide lists all the sizes from loveys and swaddling blankets to king-sized throws. Finally, I also included divider pages to make your printable planner and/or pattern binder easier to organize. I know a lot of you print out your patterns or have your own resources already. Print this planner out, hole punch it and stick it in a binder to organize all your patterns and resources in one place. These last few pages are to divide the binder into sections. You can separate your crochet patterns, your knitting patterns, the resource pages, supply pages, etc so your binder stay neat and organized. My Knit & Crochet Printable Planner, with all its pages, resources, and guides, is only available in my Etsy shop. I’m so proud of this and I turn it to over and over again to help me out. I’m a crafter, so I know the things we look for. I searched high and low for something like this but I always came up short. There was always something more I wish other planners included and this is one that I’m completely over-the-moon happy with. And BONUS – it comes in a bunch of colors. If there’s a specific color you want, I can even make it for you. Thanks so much for reading! I create new resources all the time, so be sure to subscribe to the newsletter to be the first to know about new freebies, products, patterns and so much more! Just fill out the box down below and you’ll also get access to the resource library.